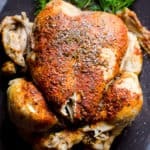 Make rotisserie style whole frozen chicken in pressure cooker with 5 mins prep. It comes out super juicy! Rinse frozen whole chicken with cold water and pat dry with paper towels. Drizzle with a bit of oil and using your hands rub it all over chicken. This step will ensure proper “sticking” of spices to frozen chicken. Place chicken in Instant Pot breasts side down. Sprinkle half of each spice evenly on one side of chicken in the following order: salt, pepper, garlic powder, smoked paprika and oregano. Holding onto the wings, carefully flip the chicken (we don’t want to disturb the spices) and season the other half with remaining spices (might seem like a lot but trust me). Holding onto the sides transfer chicken onto a large plate. Inside the Instant Pot, add water, then place the steam rack with handles and chicken breast side up on top of it (holding onto the sides, you know the drill by now). Close the lid, set pressure vent to Sealing and press Pressure Cooking on High for 35 + minutes depending on your altitude (please see notes). Display will say ON, Instant Pot will take about 15 minutes to come to pressure, you will see a bit of steam coming out from a valve, then float valve will rise and countdown will begin. After 35 minutes your chicken is ready, Instant Pot will beep, display will say OFF and now it needs to bring pressure down before you can open it, which will be indicated by a dropped down float valve. It is called Natural Release and DO NOT do Quick Release (turning sealing valve to Venting position). It should take about 15-20 minutes. Open the lid and you will have the juiciest and most flavourful chicken ever. Serve however you like, shred for meal rep, freeze for later, save bones for bone broth. Oh, and that flavourful broth at the bottom makes amazing soup the next day (don’t throw away!). So many options it’s crazy! Sea level and 4 lbs organic chicken – 35 minutes. Sea level and 4 lbs conventional chicken – 50 minutes. For everyone else, check altitude where you live and add 5% for each 1,000 feet to above mentioned cooking time based on your chicken type. Or if you just want to be “safe”, cook frozen chicken for 60 minutes will solve all issues. The worst that will happen, it will fall off the bone.